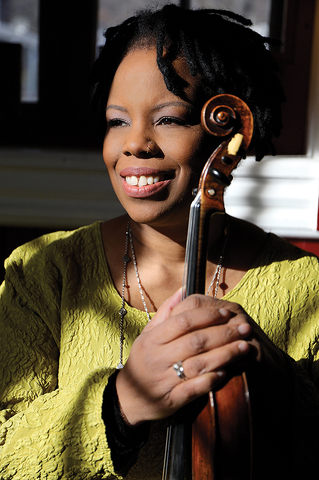 (Photo by Christopher Drukker) Regina Carter studied classical violin at the New England Conservatory of Music before taking a different path. If someone can evoke the sound and spirit of one of the most beloved jazz vocalists of all time – without being a singer – it’s Regina Carter. In the realm of jazz violinists, Carter reigns at the pinnacle of the pyramid. The MacArthur Foundation “genius” Fellowship recipient will make her sixth appearance on a Penn State stage to honor Ella Fitzgerald. Carter’s Simply Ella concert, a January 31 Center for the Performing Arts presentation at Schwab Auditorium, will feature music from the Ella: Accentuate the Positive album, released in 2017 to coincide with the 100th anniversary of Ella Fitzgerald’s birth, plus other selections. The album is a “beguiling tribute” on which Carter “honors Ella Fitzgerald with exceptional warmth and sincerity,” notes a Jazziz critic. Carter studied classical violin at the New England Conservatory of Music before taking a different path. “When I transferred to Oakland University in Rochester, Michigan, I went to the big band director there, Marvin ‘Doc’ Holladay, who played with Dizzy (Gillespie) and many others, and I told him I wanted to play jazz. And he told me to stop listening to the violin players I was listening to and to listen to vocalists and horn players. He said for the phrasing and the breathing,” she recalls in an interview with a reporter for Digital First Media. Carter will be joined by her band, which includes keyboardist Xavier Davis, bassist Chris Lightcap, guitarist Marvin Sewell, and drummer Alvester Garnett. Each of the musicians performs on the Accentuate the Positive recording. Patricia Best and Thomas Ray sponsor the concert. For tickets or information, go to cpa.psu.edu or call (814) 863-0255.